Home > Comet Clutches and Parts > Comet 205331A - D/S W/BSH, 10 Tooth. > Comet 206170A, Comet SCS 400 Series. 10 Tooth. > Comet 203963A, LA 400 Series Chain Clutch. 11 Tooth > Comet 206169A automatic centrifugal clutch. Comet Industries 206169-A. SCS 400 Series Drive Clutch. Comet 206169A “SCS 400 Series” Self Contained Centrifugal Clutch. Single Sprocket. Specs: 1" Bore, 1/4" Keyway, #35 Chain (Pitch), 12 tooth sprocket, Extra-Heavy duty Needle Bearings. Especially made by Comet Industries for Direct drive Go Karts, Mini-bikes, Homemade Karts, and Boonie-Bikes. 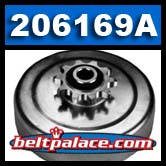 Comet 206169-A automatic centrifugal clutch. For use with 7 HP (MAX) 4-cycle Engines. Engages at 2000 RPM (approx. ).